The Ordinary DOUBLE VALUE PACK 2 X Buffet 30ml Bottles. 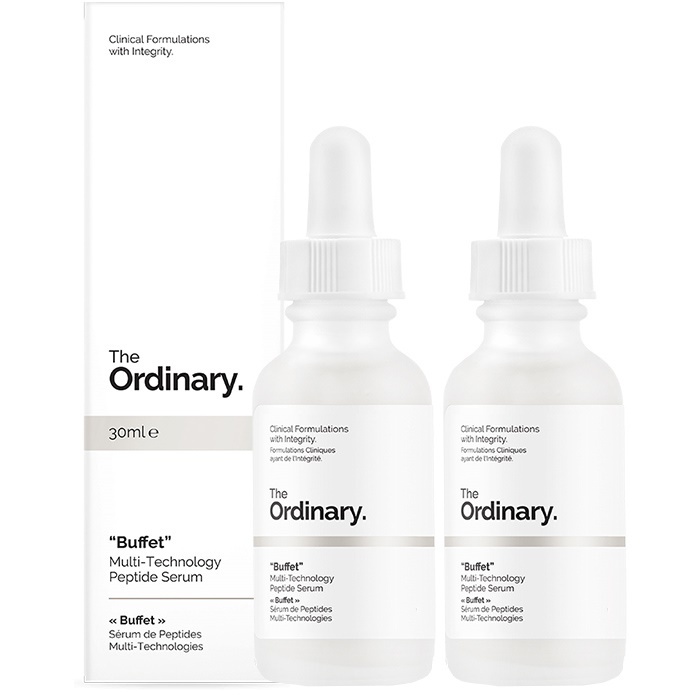 Multi-Technology Peptide Serum This formula combines a comprehensive array of studied technologies to target multiple signs of ageing at once. The technologies are Matrixyl 3,000 peptide complex (with palmitoyl-pentapeptide 35), Matrixyl Synthe'6 peptide complex (with palmitoyl tripeptide-38), Syn-Ake peptide complex (with dipeptide diaminobutyroyl benzylamide diacetate), Relistase peptide complex (with acetylarginyltryptophyl diphenylglycine), Argirelox peptide complex (with acetyl hexapeptide-8, pentapeptide-18), Probiotic complex (with lactococcus lactis lysate), in a base of 11 skin-friendly amino acids and multiple hyaluronic acid complexes. The total concentration of these technologies in the formula by weight is 25.1%. Directions: Apply to the entire face in the AM and PM after cleaning. This brand has products that are great value for money and actually work. If you only use one product from this range, use this one. It has improved the texture of my skin so much.